HOUSTON, April 14, 2014 /PRNewswire/ — Venterra Realty is pleased to announce that 98% of its apartment communities received the 2013 ApartmentRatings.com Top Rated Award. 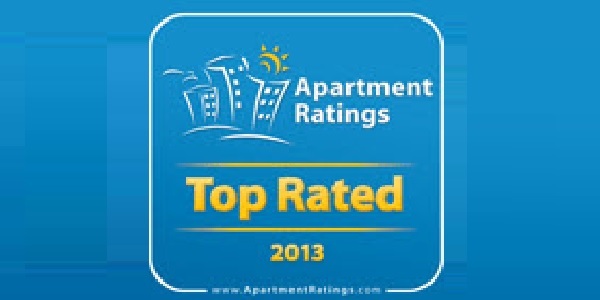 ApartmentRating.com’s “Top Rated” award recognizes the best apartment communities in the nation, as by actual residents. ApartmentRatings.com (www.apartmentratings.com) is the leading apartment review website. Only 7% of all communities listed on ApartmentRatings.com qualify for the Top Rated award consideration, which makes winning the Top Rated award an exclusive accomplishment. Winning communities demonstrated a combination of outstanding resident satisfaction ratings and excellent recommendation ratings, as reported by actual residents on ApartmentRatings.com throughout 2013. A full listing of winning properties and more information on the awards can be viewed at http://www.apartmentratings.com/rate/2013topratedawards. Venterra Realty continues its endeavor of superior Customer Excellence by maintaining a rich online presence – a large portion of which is dedicated to being transparent by responding to the voice of its customers and residents. Venterra Realty is a leading owner/operator of multi-family real estate focused on the Sunbelt States with properties located inTexas, Georgia, Florida, North Carolina and Tennessee. Founded over 10 years ago, we have grown to over 17,000 units with over 500 employees. In the last 3 years alone, our portfolio of managed properties has grown by 45%. More importantly, we measure our success by our growth as a thought leader in this industry. We are paving a new way, building a culture in which our employees can really make a difference, career growth is available and our residents are provided an amazing living experience! To learn more about Venterra Realty, its culture, and current job opportunities visit https://venterra.com. We’re actually no longer managing Merrywood Apartments in Katy, so I’m afraid we’ll be unable to provide pricing for the community, but we’d like to encourage you to explore our Houston area communities from our website here! I never thought my heart could be had. Venterra Won. I have been a resident with the Venterra Properties for eight years and have not been disappointed. Work moved me away from my home into the Houston area. Venterra agents from neighboring cities and areas all helped me find a Venterra Property near my new job. Sadly there wasn’t one. I chose another one in Kingwood, Texas. By chance a friend of a friend’s hair dresser’s lawyer mentioned that purchases one of the top complexes in the Kingwood area that sported the highest quality living state. I was overjoyed. I visited the Bala Woods (a new Venterra Property) town homes and as I walked in I was greeted with a genuine smile and relaxed atmosphere. I told them of my need but still had to live out my lease at my current complex. I told them I would be back in ten months. Upon the end of the 10 months I went back and Bala Woods. Upon walking through the doors the property manager said….”VIRGILIO”….I was stunned that she remembered my name after ten months and pronounced it correctly. Without a beat, Kimberly, Darcy, Christina and Anthony all took on my account and started me upon the Venterra experience. Not only did these agents help me get started on my new apartment but my previous property manager from my home town (Crysta) was in communication with this current group of agent to make sure my experience was well attended. I cannot make up such a story. All of this is true. Kim and the agents at Bala Woods made and continue to make me feel like a friend when I enter the doors. We talk, chat but best of all they know every one of their residents like family. I have never been so happy to find a complex that not only has a product that I LLLLOVE but people managing it that are REAL PEOPLE whom genuinely bend over backwards to make one feel comforted. I am glad I am with Venterra Living but most importantly overjoyed that I live in a clean, safe, responsible and well attended community that isn’t serving to an domineering corporate thumb but a truly gentile and classy organization that with open arms welcome you home. Thank you Crysta, Kimberly, Christina, Darcy and Andrew everything!!! Thank you so much for sharing your experience with us, Virgilio. We know that our teams work hard to provide superior customer service to our residents, but what you described speaks volumes above that. We are so honored that you chose to move into another one of our communities. You are family to us and to Crysta, Kimberly, Christina, Darcy, and Andrew. Thank you for continuing to make your home at a Venterra community and for taking the time to share your thoughts about our team. To all of this we say, WOW! We are completely touched.